This compilation of spells and charms is a treasure-trove in two senses. Firstly by being a compilation of spells and charms covering all possible areas, it be about curing animals, love charms, protective charms and spells or for healing. In this way it serves as both preserving legacy and also invite in inspiration for how to deal with particular issues grounded in traditional folk magic. Secondly the treasure in this little book is found in the spread of spells and charms from the use of Solomonic elements and practical contemporary use exemplified in spells to bring misfortune to Hitler during the WWII there is also an impressive timeline here that embraces spells and charms dating back to the 9th Century and up to WWII, this spread across this timeline is in itself something that makes the book impressive as it allows us to see consistency and difference across time and place and in this clearly see the constant presence of vital elements involved in given workings. Joint to joint, thus glued together be! This way of creating a mythical magical charm involving otherworldly beings remained a popular part of the arsenal of practitioners of folk magic as the many Black Books or Cyprian in Norway and Sweden should testify to where we there find saints and apostles called upon in similar manner for various ends which in itself testifies to the elegant fluidity and adaptability to powers for what they could do was truly a trait of the cunning ones. 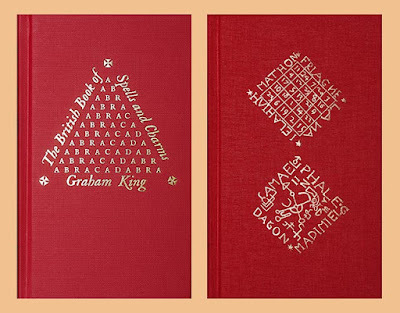 In TheBritish Book of Spells and Charms Graham King have in his own way ensured a transmission of wisdom, a wisdom both practical and inspiring, presented in a most clever and illuminating way.